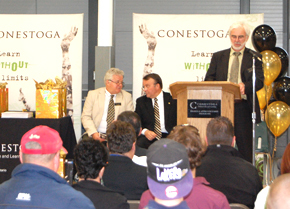 On May 18th, Conestoga’s School of Trades & Apprenticeship hosted its second annual Awards Presentation and Barbeque in the Roofing Centre at the Waterloo Campus. More than 250 guests including business owners, industry professionals, faculty and family members watched as Greg White and Stephen Speers, chairs of the School, presented 82 awards valued at more than $42,000 in total to students in motive power, construction and industrial programs. Guests enjoyed a barbecue after the awards presentation that included delicious desserts prepared by Conestoga’s Cook 2 apprentices and Cook 1 OYAP students. Thanks go to Altruck International for providing a Dump Truck and Toromont CAT for providing a Tractor Loader Backhoe for display. Thanks also to the Automotive Faculty from the Guelph Campus for bringing the Conestoga Mustang. Congratulations to the many award recipients for their achievements this past year and thank you to the industry partners and donors for their contributions to the students’ success. Special thanks to all of the Trades & Apprenticeship faculty and staff for their support in making this event such a great success. The School of Trades & Apprenticeship is the centre of apprenticeship and skills training in Canada’s Technology Triangle. 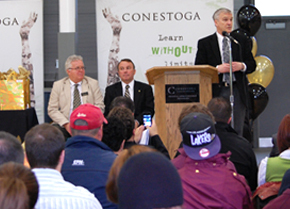 Conestoga provides a comprehensive array of programs in Construction, Electrical, Metal Cutting, Industrial Maintenance, Welding & Fabricating, Motive Power and Cabinet Making in response to the needs of industry, and the growth in our local economy. Donor: Menno S. Martin Contractor Ltd.
Donor: Cambridge Materials Testing Ltd.